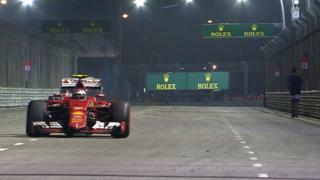 A spectator goes for a stroll along the track in the middle of the Singapore Grand Prix. Race leader Sebastian Vettel is the first to encounter the spectator, exclaiming "there's a fan on the track!" on his team radio. Vettel went on to take his third win of the year in dominant style, controlling the race from start to finish.